College basketball is back, and it will be in full force in downtown Brooklyn through the end of the week. The Barclays Center will play host to four separate tournaments and events through Saturday, and fans can find tickets for relatively cheap if searching the secondary market. With the Legends Classic, NIT Season Tip-Off, Barclays Center Classic and Brooklyn Hoops Holiday Invitational all taking place over the next five days, TicketIQ has available inventory for all 11 games. The 2016 Legends Classic Doubleheader will commence on Tuesday and pen Texas and Colorado in the consolation game followed by Northwestern and Notre Dame in the championship game. Legends Classic tickets on TicketIQ currently average $28, making it the cheapest event to attend in Brooklyn this week. Tickets start from just $5 and honor both games on Tuesday. On Thursday, the NIT Season Tip-Off will showcase two preliminary games featuring Florida State, Temple, West Virginia and Illinois. NIT Season Tip-Off tickets at Barclays Center currently average $78 and the get-in price is $34 for Thursday's two games. The winners of those two games will go on to play in the Championship Game on Friday, while the two remaining teams will play in the preceding Consolation Game. 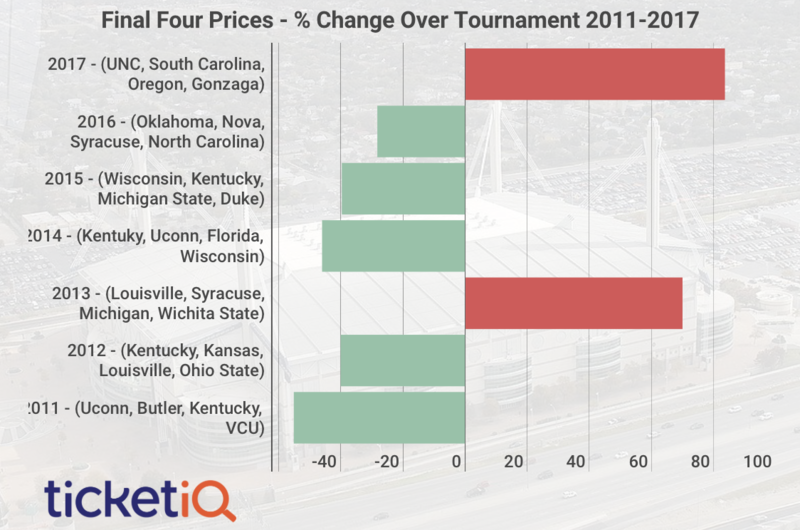 Tickets to Friday's NIT games now own a secondary market average of $88 and start from $23 each. Friday will also play host to the two preliminary Barclays Center Classic games. With Maryland, Richmond, Boston College and Kansas State all participating, Barclays Center Classic tickets to the two opening games on Friday are averaging $74 and the get-in price is $30. The Consolation Game and Championship Game follow on Saturday, where tickets on TicketIQ average $77 and can be found from $33 each. Perhaps the most anticipated game will occur on Saturday afternoon. This year's Brooklyn Hoops Holiday Invitational will feature Syracuse and South Carolina going head-to-head in the early-season matchup. With both teams expected to be relevant in the Dance come March, it comes as no surprise that it will be the most expensive individual college game in Brooklyn this week. Syracuse tickets at Barclays Center now own a secondary market average of $77 and the get-in price is $33.